Description: This classical conservatory sums up a completely different look – the room has a more formal feel, and would be an unusual setting for candlelit dining. There are several key elements that create this sophisticated botanical interior. Select a traditional black and white floor design – the floor shown combines Onyx Marble with Juniper keys from Amtico. 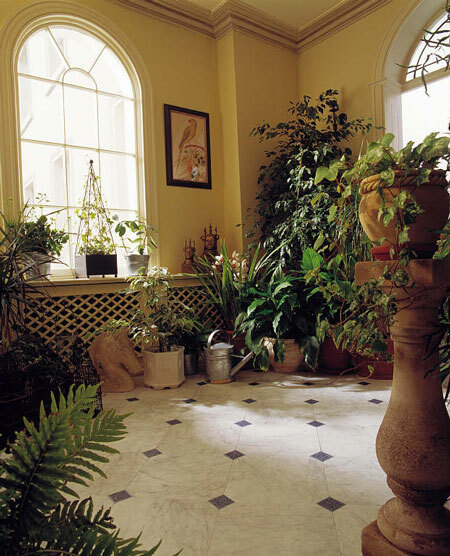 The vine-like texture in the keys has been hand-carved – add wrought iron furniture and plenty of plants to complete the effect. If you prefer a more dramatic look, a black and white chequerboard floor would also work well in this style of room – take a look at our ‘Marbles’ for ideas.